Getting organic and eco friendly is the way to go these days and little surprises that the same has come good in the insecticide industry as well. 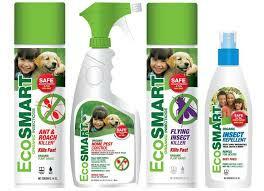 Ecosmart is an organic insecticide that can come good against ants and roaches – the common pests in most American homes. This is a minimal risk insecticide and safe to use inside our homes. Less toxic as plant ingredients are used. These have been classified as good grade ingredients that are safe to use. Recommended to be used in all possible inlets for ants and roaches and there is a visible difference. The ants in particular are not very fond of this. Ensure that you use it in cracks and holes just as a precautionary measure so that these creatures do not find your home comfortable. There are no harsh chemicals and are as good as home made alternatives. Frequent use can keep your home out of reach for these pests. Previous Tempo Ultra SC Solution For Bugging Problems!